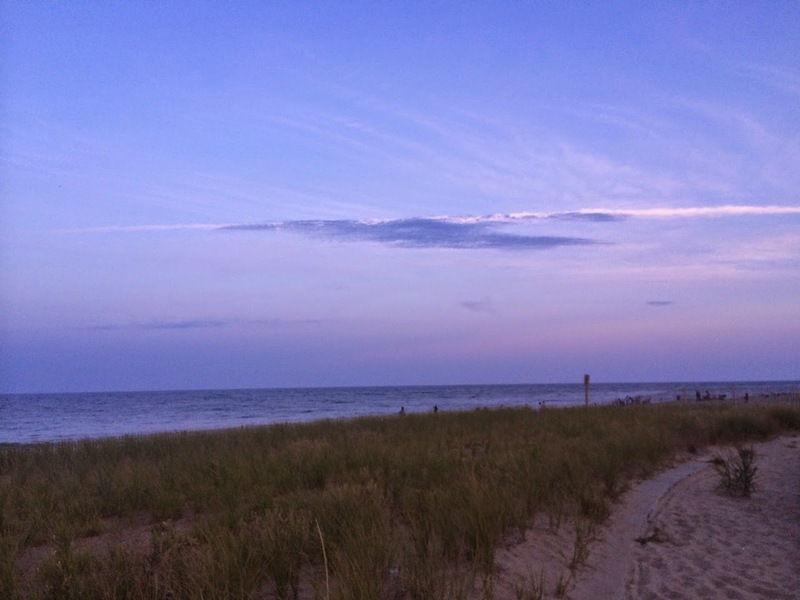 It may seem odd to put out a beach town dining guide after Labor Day; however, 1) we didn't get to beach this year until the end of the summer, 2) it's still beautiful at the beach and less crowded, so why not go now? 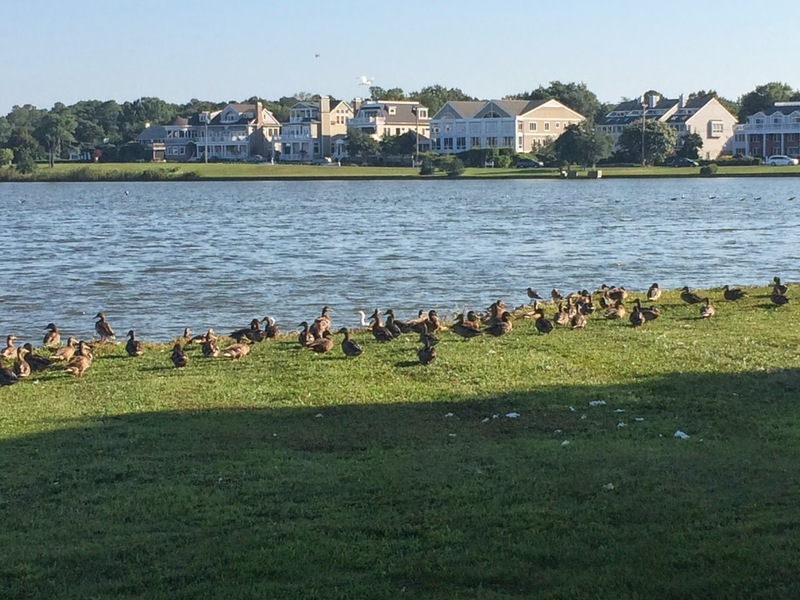 Thus, I present part 2 of my Rehoboth Beach dining guide, based on restaurants we visited this year. Check out part 1 from 2 years ago, which includes many favorites we've since revisited, including Dos Locos (still serving great fajitas and margaritas) and Grotto Pizza, our traditional first stop upon arriving in town. I also recommend a(MUSE), which we ate at last year. 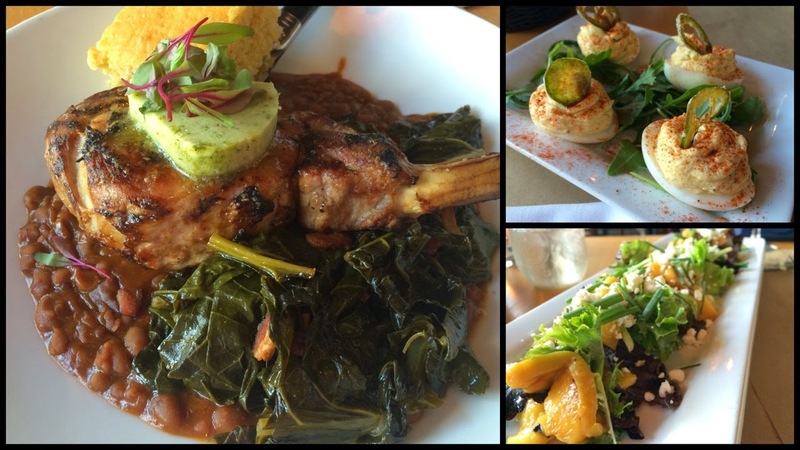 Salt Air pork chop, crab deviled eggs and grilled peach salad (our favorite meal of the week). I've wanted to check out Salt Air for a long time. The handsome space, divided into multiple rooms with large windows that all look out onto Wilmington Ave., is always hopping and they take only limited early reservations. But we got lucky recently when we found a night where they weren't as busy (by that, I mean that pretty much every table was full but there wasn't a line down the block). I'm so glad we did, as the food was really quite good. Our entree was fabulous: a grilled sweet-tea-brined pork chop served with smoky bacon beans, collard greens, cornbread and charred scallion honey-butter. The pork chop was cooked through but still tender and juicy, the collard greens had just the right texture and the smoky beans were sensational. Only the cornbread disappointed, as I thought it was too sweet (more like a dessert); however, I'll point out that Chris really liked it. Our crab deviled egg starter and grilled peach salad with goat cheese were also quite tasty. With a good wine list and friendly service, Salt Air is a place we'll definitely be working into our regular rotation of restaurants. It was our favorite new beach dining experience this year. 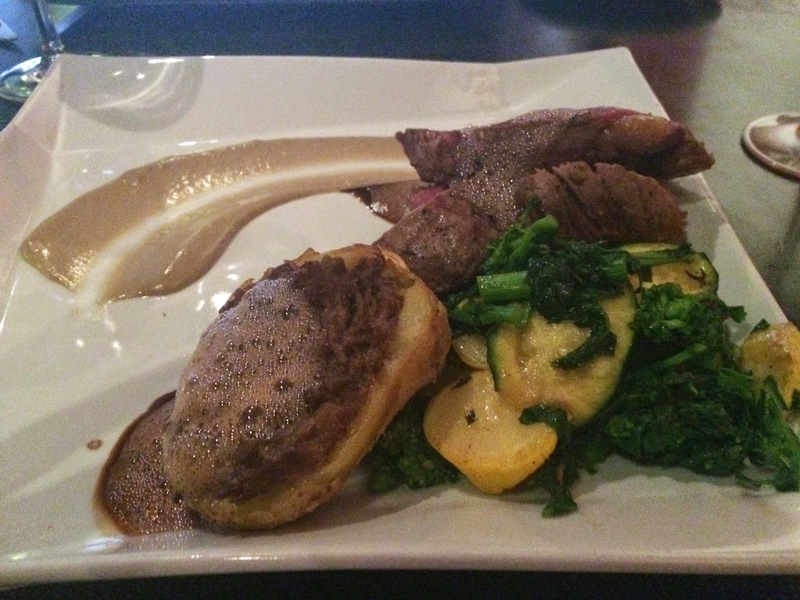 Espuma filet of grass-fed beef with shortrib-stuffed potato skin, wild mushroom puree, rapini and squash. Espuma caught my attention 2 years ago when its chef, Jay Caputo, was a semi-finalist for the James Beard Award for Mid-Atlantic chef, a list generally dominated by talent from Washington, Philadelphia or Baltimore. We finally made it into Espuma this summer and were not disappointed by the restaurant's creative presentation and flavors. The Bacon & Egg starter features its namesake ingredients two ways: separately, as bacon bits nestled into a salad of local greens and a "crisp" duck egg (presumably lightly battered and fried after being soft-cooked for a runny center), and together as smoked bacon "brûlée"--imagine creme brûlée custard made with bacon. The cherry tomato-grilled corn salad was another nice way to start the evening with a lot of fresh flavors. Sous vide has been all-the-rage in food circles lately, but I haven't tried it much, so I couldn't resist ordering the spicy sous vide 3-days pork. The tender meat was accompanied by a vegetable strata and tomato emulsion. Extras from the kitchen aren't essential for a great dinner, but I did enjoy that we started the evening with a taste of gazpacho and bread with three spreads, including roasted garlic, which I haven't had spread on bread in a long time. 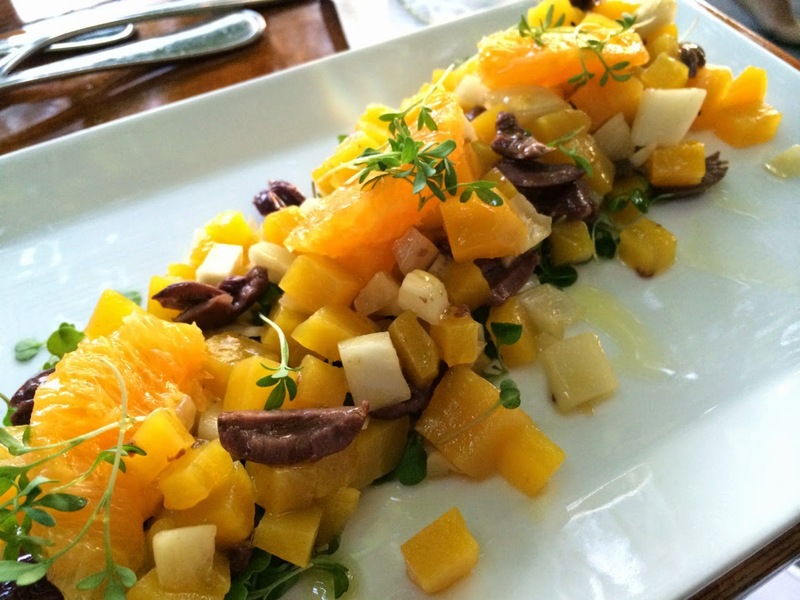 The Back Porch Café's salad of golden beets, oranges, black olives, arugula, fennel, sherry vinegar and olive oil. The Back Porch Café was a late-breaking substitution for a restaurant we had reservations at but canceled after a frustrating evening the previous night trying (unsuccessfully) to order wine in their bar. 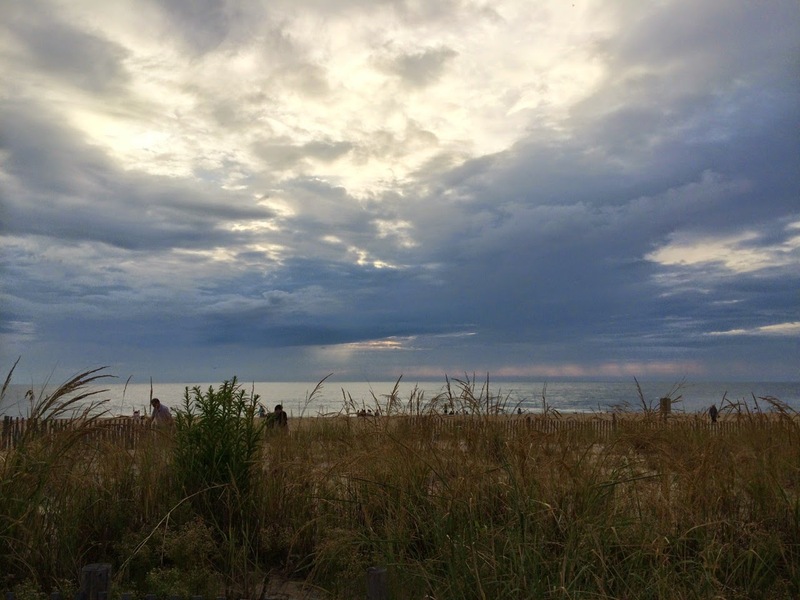 We overheard on the beach that The Back Porch was the best restaurant in Rehoboth (amazing how many good tips come from "overheard on the beach"), so we decided to check it out. While I wouldn't go as far as saying it's the town's best, it's certainly an enjoyable experience. One of its greatest pluses is the romantic ambience, a product of abundant outdoor seating under leafy trees, gentle live music and, once the sun goes down, soft lighting from lamps and candles. The food is pretty good too. I enjoyed my roast guinea hen was deliciously moist with a crisp skin and well-accompanied by butternut squash, rapini and a chanterelle ragout. Chris was excited to order a molé-rubbed pork tenderloin with black beans, corn and sweet potatoes, since we both love molé. Although the meat was nicely cooked, it was surprisingly lacking in molé flavor. However, I really liked the mingling of the fresh flavors in the beet salad with fennel, oranges, olives and arugula micro-greens. Chris's watermelon and strawberry salad was also a great flavor combination, although I would have preferred it served with pieces of fresh mozzarella and torn basil leaves rather than the large chunk of cheese and clump of herbs that were served. Everything but anchovy pizza from Nicola Pizza. 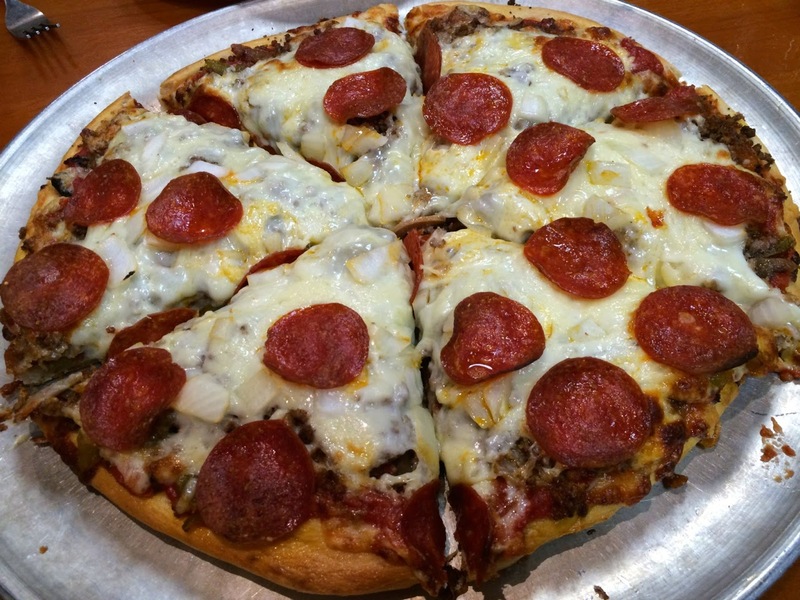 When it comes to pizza, although we're big fans of Grotto Pizza, it's not the only game in town. Nicola Pizza engenders a similar loyalty and, like Grotto, has been around for decades and has multiple locations (well, just two, and they're just around the corner from each other). If you're hoping I'll report that we became Nicola converts, you'll be disappointed. We did, however, greatly enjoy the pizza, which is thicker than Grotto's pizza. We ordered the Everything No Anchovy pizza, which comes with pepperoni, mushrooms, extra cheese, sausage, ground beef, sweet peppers and onions, a similar mix of topping to our beloved Baker's Choice at Grotto. On tap to help wash down the pizza is locally made Dogfish 60 Minute IPA (which, I'll point out, Grotto has on tap too). 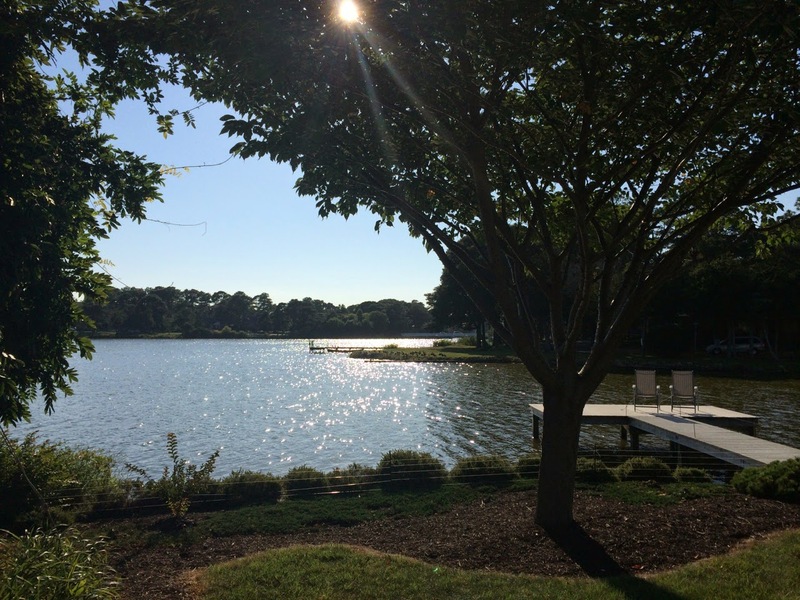 For years, finding a good breakfast in Rehoboth has been a challenge. Several of our favorite places closed--one of which was swallowed by Sammy's Kitchen, a restaurant with food so mediocre that I wonder why it remains popular. Royal Treat does have good pancakes, but not good enough to justify the wait. Although I mentioned Corner Grille briefly in my 2012 dining guide, I think it deserves more copy, as it's since become our favorite breakfast place in Rehoboth. The cafe serves a mix of Greek and American foods. Get the best of both worlds with the Greek omelet, which comes with gyro meat, tomatoes and feta cheese (I think an addition of onion make it even better). I also found their western omelet, a standard mix of ham, onion, bell pepper and cheese, to be about as perfectly executed as I've ever had a diner omelet. In addition to a selection of omelets, they have pancakes, waffles and French toast. With prompt, friendly service and reasonable prices, we felt little need to find other breakfast options this year. Last time, I focused my treats section on ice cream--and stand by my recommendations for Kohr Bros. if you want good soft-serve and Royal Treat for incredible traditional ice cream like the vanilla-peanut butter swirl. But there are other great treats to be had on the boardwalk as well. I didn't expect to be into Thrasher's fries, but I agreed to try some this time, and they are definitely satisfying fries: warm, freshly made, just salty enough and perfect with a few squirts of apple cider vinegar. Another great boardwalk treat is the caramel popcorn at Dolles, which you can buy by the tub. They may be better know for their saltwater taffy, but I'll take the burnt-sweet crunch of caramel-coated popcorn over taffy any day. The Back Porch Café, 59 Rehoboth Avenue (between 1st Street and the boardwalk). (302) 227-3674. Reservations: call the restaurant. Corner Grille, 11 S 1st Street (at the corner of Wilmington Avenue). (302) 227-7653. 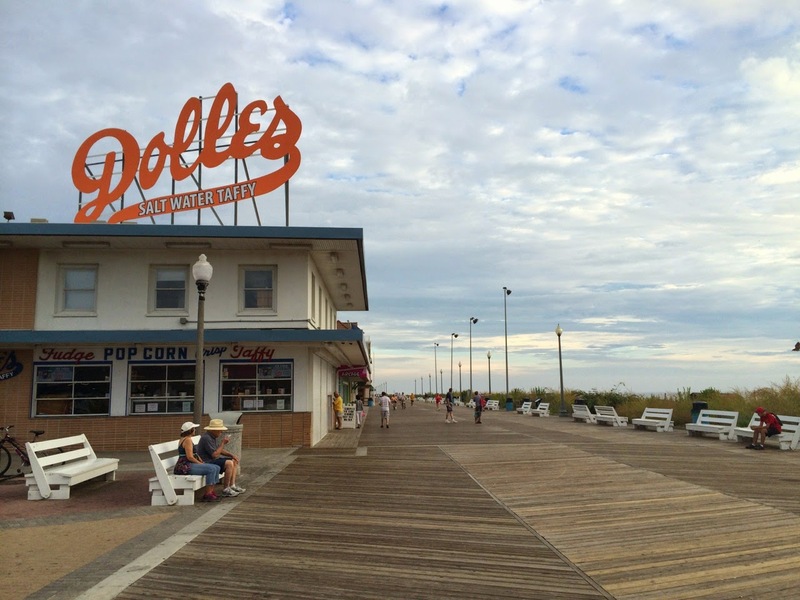 Dolles, 1 Rehoboth Avenue (at the boardwalk). (302) 227-0757. Espuma, 28 Wilmington Avenue (entrance on S 1st Street), Rehoboth Beach, Del. (302) 227-4199. Reservations: Open Table. Nicola Pizza, 8 N 1st Street (between Rehoboth and Balitmore Avenues), Rehoboth Beach, Del. (302) 227-6211. 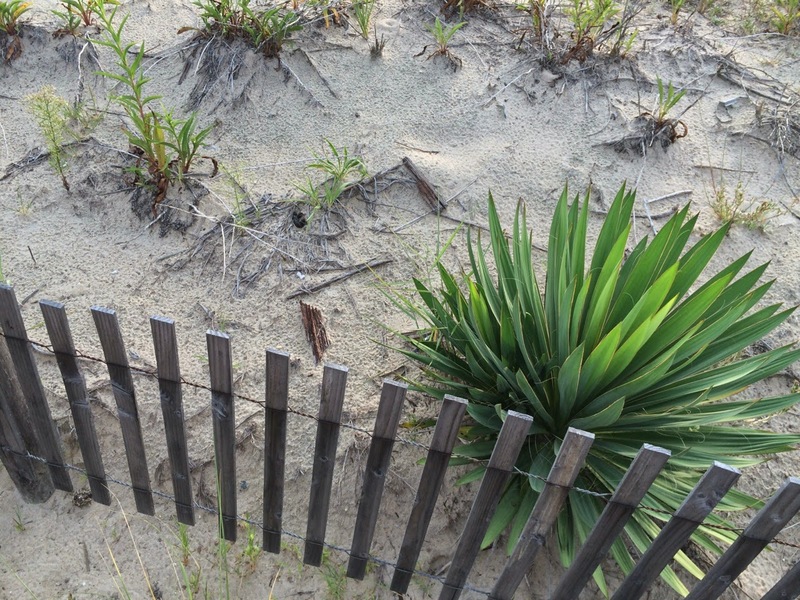 Salt Air, 50 Wilmington Avenue (between 1st and 2nd Streets), Rehoboth Beach, Del. (302) 227-3744. Reservations: limited availability for early hours (call the restaurant). Thrashers Rehoboth, 101 South Boardwalk (at the corner with Wilmington Avenue), plus two other locations on Rehoboth Avenue.